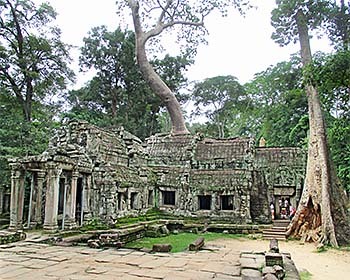 Together with Angkor Wat and Angkor Thom, Ta Prohm is the third centerpiece of Angkor Archaeological Park. 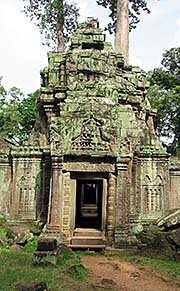 It lies roughly a kilometer east of Angkor Thom and spreads out inside an by a wall enclosed area of 1,000m times 600m. Despite fundamental restoration, Ta Prohm has been left in a state of being half-overgrown by tropical rainforest, giving the ruins an appearance as they were when discovered in the 19th century. 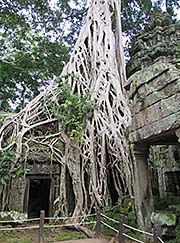 Ta Prohm is also a site where the ridiculous Tomb Raider movie with Angelina Jolie was produced. The construction of the site dates back to 1186 CE, as an inscription on the founding stone documents. That was the time soon after Khmer king Jayavarman VII (reign from 1187 - 1226 CE) drove the Cham out of Angkor City, which they had conquered years before and kept occupied. Jayavarman VII was the king who let built by distance most of the Angkorean monuments. The whole new capital of Angkor Thom with the central state temple Bayon was built under him, as well as another large temple closely north of Angkor Thom, Preah Khan. The 'royal monastery' of Ta Prohm was called Rajavihara and inhabited by 12,640 people of who were 2,740 officials, 2,232 assistants, 18 high priests 615 dancers. In the surrounding hamlets and villages lived 80,000 people who supplied the monastery with food and services. Ta Prohm was a rich place, where treasures of alltogether five tons of gold, valuable pearls and silk were stored and used for representative issues. 260 gods and deities were worshiped in the temple site. It served also as a kind of university. The exit from the temple compound towards the western gate (gopura). Most visitors enter the site from the western gate and see the western front first. 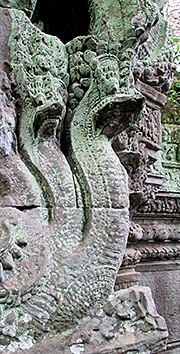 Rajavihara / Ta Prohm's buildings were dedicated to the king's family. In the temple's main fresco, Prajnaparamita, the personification of wisdom, is the king's mother immortalized. The northern and southern temple wings are dedicated to the king's brother and the other one to the king's guru (teacher). 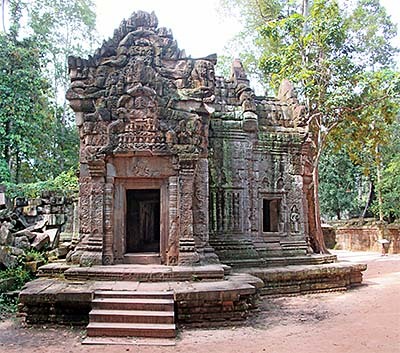 Originally, it was a Mahayana Buddhist temple, although many of the Buddhist frescos fell later victim to Hindu iconoclasts, for the state religion in later Angkor changed several times. It's an interesting question why Jayavarman VII changed the official religion from Hinduism to Buddhism. The implications where far-reaching; particularly it meaned a great loss of influence for the old, established Hindu priests, who were in powerful positions, being replaced now by a new clergy of another religion. 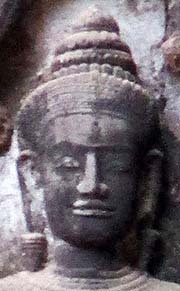 However, after Jayavarman VII's death, probably in 1220 CE, his successor Indravarman II changed the state religion back to Hinduism. 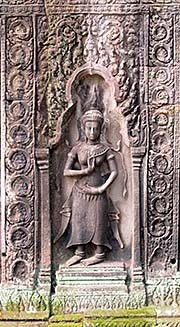 Later again, a future king changed it eventually to Theravada Buddhism, what is still the state religion of contemporary Cambodia. 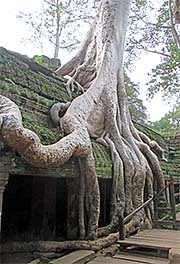 Ta Prohm was inhabited, maintained and partially expanded until the 15th century. 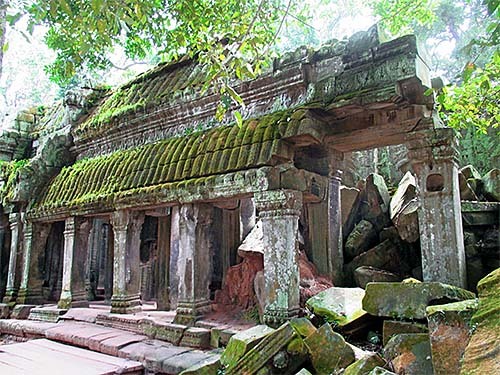 In the aftermath of the fall of Angkor Thom (1431 CE), the site became abandoned and more and more overgrown by the jungle. It lasted until the 1920s that a first clearing and later restoration took place. Despite the neglected appearance of an overgrown temple complex, extensive restoration made sure the future sustainability of the remarkable buildings. To channel the masses of tourists who pass through here every day, wooden walkways with small platforms and roped railings have been installed. Still it's possible to walk apart from it and even to climb on parts of the ruins; however, that does the site no good. The touristic visitors approach mostly through the west gate, a gopura which is crowned by the four-headed face of a Boddhisatva, supposedly the face of Jayavarman VII himself. The whole, walled area is large and now mostly overgrown with forest. The northern and southern entrance gates are now closed; the eastern gate is further away from the main building than the others. That was the original entrance gate from where the royal processions walked towards the main building; most of the medieval Khmer buildings are aligned in the pattern of an east-west axis. The ruins of Ta Prohm are quite large and consist of a complicated assemble of buildings, all built in early Bayon-style. One needs quite a time to make the way through, having a look for all the many rooms, chambers, gangways and stone carvings. Many of the carvings are half-hidden and need to be discovered, and some of the galleries are impassable, filled with debris. Alltogether are 39 towers in Ta Prohm, connected by a labyrinth of galleries. The atmosphere is coined by the flair of disrepair, suggested by the many trees, mostly figtrees (Ficus virens), who overgrow parts of the buildings. This actually somewhat spooky appearance stands in stark contrast to the masses of touristic visitors who permanently roam through the temple compound. They are usually noisy, come often in large groups (whole busloads, most visitors nowadays are from China), and most of them are very keen to get their many I-was-here-photo-click-click done. As everywhere in Southeast Asia, the temples have been built in stone, while the dwellings of the common people, but also those of the state functionaries and upper classes including the royal family, have been built in wood, which doesn't stand the test of time in the tropes. So, what is now forest around the ruin and looks as if it has never been inhabited, was once certainly a vibrant town, occupied by the buildings of monks and priest and their servants. 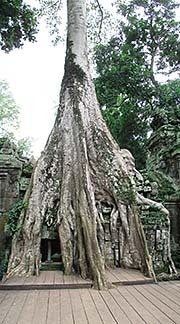 Ta Prohm gained the status of a UNESCO World Cultural Heritage in 1992. 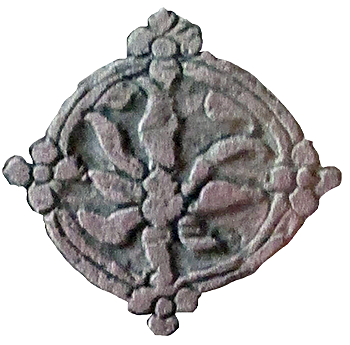 Restoration is done here by the Archaeological Survey of India in cooperation with the APSARA administration. This article is based on two visits and personal observations. Moreover it's based on a number of publications. You find a list of them on the Literature page. Most notably here is Maurice Glazier's classic 'The Monuments of the Angkor Group'. However, it's not at all exhausting; it comes together with articles from newspapers, magazines, (qualified) websites and movies, both fiction and documentary. Sometimes, a good talk with a connoisseur of a certain topic provides me with facts, ideas, inspirations and innovations and/or reveals a mistake.